Estero Bay is actually the first aquatic preserve established in the State of Florida, which happened in 1966. This area was known to be a special place early in Florida’s history due to its pristine waters and abundance of marine and coastal wildlife. Today, Estero Bay remains the beacon of natural Florida ecology and is a premier destination for those fly fisherman looking to fish “the real Florida” for those famous inshore species. Grass beds hold a variety of species and activity can be tidal dependant, while deeper pockets can hold fish at any time. Here fly fisherman can expect to target seatrout, redfish, and even snook. Easily a fly fishing favorite here in Estero Bay, sight fishing the expansive tidal flats is a true hunt. While being poled on the deck of technical poling skiffs, looking for pushes along the surface of the water, fly fishermen can target redfish, black drum, sea trout, and even some species of shark. If you’re looking to battle a linesider, this is where you really want to be. Snook are ambush predators and spend a lot of their time lurking in the mangrove root systems, as well as cuts between mangrove islands during tidal changes. 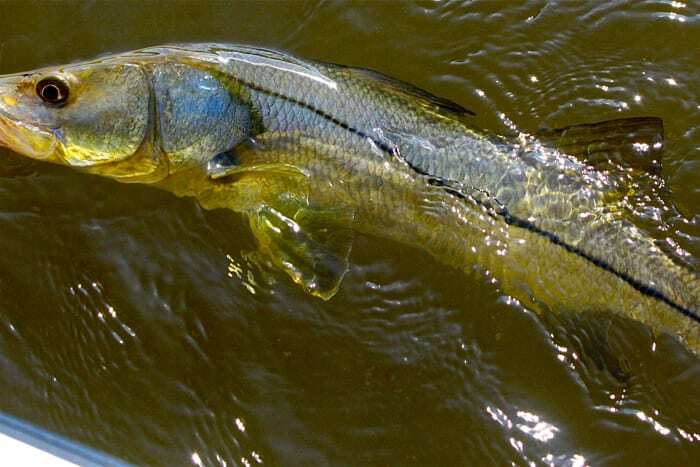 Fly fisherman will rely on their vision to find snook laid up in these locations. However, mangrove systems attract a large variety of species. These include sea trout, redfish sheepshead, grouper, snapper, and some more predominant species of shark. Oyster beds are a good place to find your species on a crustacean diet. Generally redfish and sheepshead, but many surprises also lurk around the oyster beds. Though not a primary way to fly fish here, channels can offer some opportunities for fly fisherman to go after resident tarpon, barracuda, big jack’s, and even ladyfish (on a slow day).